Mr. Eisenberg Spends Time With Students Discussing Due Diligence In Real Estate Transactions. 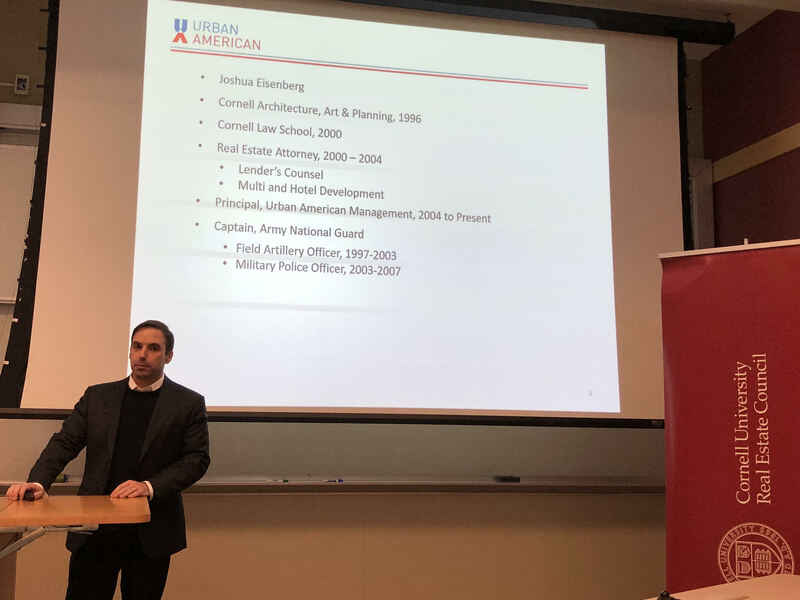 Last week, the Baker Program in Real Estate had the special honor of welcoming alumnus Mr. Joshua Eisenberg to speak at the weekly Cornell Real Estate Distinguished Speaker Series. Mr. Eisenberg is an Executive Vice President and Co-General Counsel of Urban American Management, a real estate investment and management firm of multifamily properties in the New York area. Over the past 17 years, Urban has acquired, operated and sold over 18,000 apartment units and employed more than $1 Billion in equity from private and institutional investors. Mr. Eisenberg is actively engaged in the acquisition, management and rehabilitation of the company’s portfolios and has an exceptional track record in the workforce housing sector. Mr. Eisenberg believes in the philosophy that both landlord and tenant have a mutual long-term interest in the improvement and maintenance of the community’s housing stock and its surrounding environment. His talk focused on the value that the real estate industry creates for society and his pride in providing housing for the workforce. Holding a Bachelor of Science in Urban and Regional Planning from Cornell, as well as a JD from Cornell Law School, and drawing from his experiences in the industry, he reminded future real estate professionals of the importance of due diligence in transactions. He provided an extended checklist, from entitlements to tenant lease agreements, to illustrate how a lapse in research on any one of the list’s items could lead to calamity. Mr. Eisenberg has a keen mind for detail. He started his career in the real estate industry as a real estate attorney where he represented real estate developers and equity investors in acquiring, developing and leasing various types of real estate, including multifamily housing, office buildings, luxury hotels and retail space. He also represented financial institutions in all aspects of real estate financing, including community development loans and credit-backed, bond financed affordable housing transactions. During this time, Mr. Eisenberg served as a reserve officer in the United States Army, ultimately achieving the rank of Captain. These experiences have equipped him to be a leader and to be successful at his role in Urban American. He also has leadership roles in his community through non-profits, the Advisory Board of Cornell’s University’s Atkinson Center for a Sustainable Future and the Real Estate Advisory Board of the New York City Energy Efficiency Corporation. Students were thrilled to have Mr. Eisenberg come speak at the Distinguished Speaker Series. His talk was insightful and inspiring. The Cornell Real Estate Review thanks Mr. Eisenberg for coming and would, at any time, welcome his visit back to Ithaca for another discussion.